WEST LAFAYETTE, Ind. –- Purdue Extension’s 2011 Corn and Soybean Field Guide, a pocket-sized reference guide that allows farmers to quickly analyze troubled areas in their fields, is now available. The guide, updated annually, is filled with photographs and information to help diagnose and manage problems such as weeds, diseases and insects, said Corey Gerber, director of Purdue’s Crop Diagnostic Training and Research Center. The 324-page guide also covers soil fertility, herbicide injuries, planting decisions, nutrient deficiency and crop development. The guide is color-coded for quick reference and can be used from planting through harvest. The annual publication has been in production since 1988. 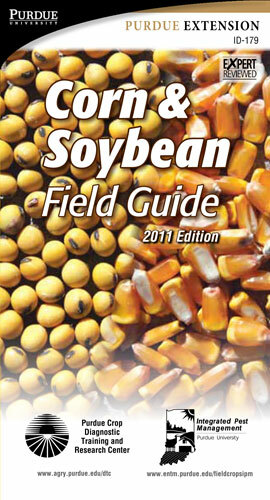 High-quality photographs, updated pesticide and fertilizer recommendations comprise the major changes in the 2011 edition. Gerber said using the guide to help manage pest problems and apply the appropriate amount of fertilizer for deficiency problems could produce top yields and save farmers money. “The guide helps farmers make the right decisions as they see an issue, and it is the most affordable source of information to take to the field,” he said. About 25 percent of the guides are sold in Indiana, with the remainder scattered nationally and globally. “The guide is not only applicable to Indiana, but other regions of the United States, as well as around the world,” Gerber said. Individual copies are $7. Guides are available from the Purdue Extension Education Store by calling (888) EXT-INFO (398-4636) or at www.the-education-store.com. They usually ship within two business days.